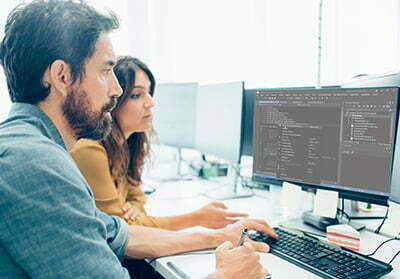 ASP.NET MVC is a new framework created by Microsoft offering an alternative development model to .NET developers who needed a modern approach to traditional systems of web development – typically utilizing ASP.NET. MVC framework provided better and additional option for the developers to employ a natural Test Driven Development (TDD) methodology with the added advantage of having a better flexibility and control over URLs and page output. The framework also provides faster rendering, improved testability, enhanced control over the rendered markup, and a better understanding of the difference between business logic and presentation logic. Why are the developers loving ASP.NET MVC? Although other frameworks such as DNN are equally popular and reliable, developers are beginning to choose MVC for enterprise applications that involve scalability aspects and higher performance needs, since this framework is systematic, cleaner, and more advanced way of implementing a structured growth of software. As the name clearly suggests, this framework clearly separates Business Layer (model), View (presentation layer) and Controller (data). This makes things easier for developers who are avidly trying to find a solution that keeps the layers of business logic and presentation separate – making it extremely suitable for enterprise web application development. MVC allows developers to test the ongoing development, while developing the project, meaning that your project does not suffer from untimely delay and poor quality. It also supports testing the individual components during the development stage and ensures supreme quality for the project. MVC provides better control over rendered HTML so the corresponding front end elements can be immediately changed without increasing the time spent on the project. It helps developers to keep pace with the latest changes and development in the user interface and usability across different domains. When a software program can be broken down in a way that results in a minimal overlap in functionality, it facilitates proper separation of data from content and content from presentation. This is where MVC takes the lead and helps developers to have better control over their software. Although many developers are of the opinion that ASP.NET MVC is now the future – it might not completely hold true. Frameworks such as DotNetNuke that was originally created for ASP.NET 1.0 will remain to stay popular among developers. Since ASP.NET MVC framework is not compatible with WebForms, it cannot support web controls, making it difficult for current projects to migrate. It is important to consider that each framework has its own set of pros and cons. It becomes necessary to consider all the goals and constraints and make an informed decision. Are you ready to develop your next project? Contact us if you are ready to utilise the power of ASP.NET MVC to drive your business goals and growth.